Supercell's hit collectible card and tower defence hybrid Clash Royale has brought in more than $2 billion in revenue. That's according to mobile intelligence firm Sensor Tower, which reports that Clash Royale took just over two years to pass the milestone. Since launching in March 2016, Google Play has slightly edged the App Store in being a greater source of revenue, taking a 51 per cent share while the latter contributed 49 per cent. US players generated the largest portion of Clash Royale’s revenue at 30 per cent. Germany followed on with 10 per cent while France came third with seven per cent. In terms of Asian territories, South Korea contributed five per cent while China clocked up 6.5 per cent on iOS alone (Android was not mentioned). Reaching the sales milestone means Supercell has become the first mobile publisher to have more than one multi-billion-dollar game on both the App Store and Google Play. Its other hit strategy game Clash of Clans has grossed in excess of $6 billion since its launch back in 2012. 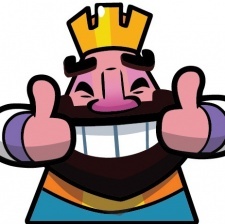 “Clash Royale continues to be a major revenue generator for Supercell, taking in more than $40 million worldwide last month, placing it second to Clash of Clans, which grossed nearly $70 million,” said Sensor Tower head of mobile insights Randy Nelson. You can check out mobile gaming's billion-dollar club right here.